This site is the classic web presentation of PSRMA. It was retired from service in August 2014 after serving the organization since 1994. This site will function as a reference to assist development of the Museum's new web site and will continue to offer extended reference material not yet ported. Please do not rely on any event scheduling information found here, it is not actively maintained. The Museum's new web site is located at PSRM.ORG, check there for current Museum information. Santa Train North Pole Limited: In association with Santa Claus, the Pacific Southwest Railway Museum is proud to announce the 2014 Santa Train North Pole Limited. These Christmas Trains are produced in conjunction with local High Schools and are a favorite for children (and adults) of all sizes and ages. Please visit the Santa Train page for event dates and links to the Museum's on-line reservation system. Tickets are available now for Museum Members and will be available for sale to the general public on August 15 2014. These Christmas Trains are very popular and seating is limited, reservations are required. Select your date and make your reservations now so you don't miss Santa. AT CAMPO - we offer the following train rides and activities departing from the Campo Depot on selected weekends. Be sure to check the Calendar for these events. Want to be a member of our operating train crews? There will be a two-day hands-on class on October 4 and 18, 2014. To qualify as a brakeman trainee, both of these days of training are necessary. Another sixteen hours of classroom training, two four-hour sessions and one 8 hour session are required. These will scheduled for various days next spring. The classes are open to anyone, 16 years of age and above. However, a minimum age of 18 is required to be qualified as a brakeman. The job can be physically demanding, but if you are interested, come out and give the class a try to see if you can do it. And, we consider the traditional "brakeman" term to be gender neutral, so ladies are welcome too! Membership in the Museum is a prerequisite for taking the classes and getting certified as a brakeman. There are other membership benefits too, please check our Membership Page for further information. You may sign-up for membership here. For class details and sign-up information, contact Jim Baker. The Pumpkin Express: The Museum is pleased to announce the 2014 Pumpkin Express. This is the eleventh annual Great Pumpkin event at the Museum. Travel to the Great Pumpkin's Pumpkin Patch and tour the Haunted Train where the kids will pick out their own pumpkin and decorate it in the Display Building. These trains are very popular and seating is limited, so reservations are required. Select your date and make your reservations now! Please don't get left behind! Golden State is a 12 mile round trip train trip from Campo through the back country mountains of San Diego County to the International Border Tunnel at Division, which lasts about one hour. 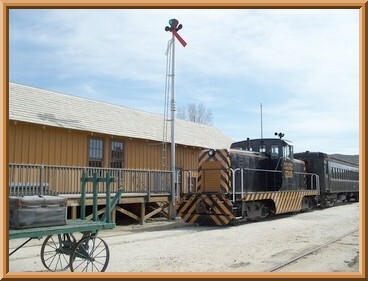 Train tickets include admission to our Railway Museum grounds and Display Building at Campo. Tickets available at the Campo Depot. Check the Calendar for specific dates for this event. Cab rides allow you to ride in the locomotive with the Engineer. These are typically available when the Golden State and Valley Flyer trains are operating. Reservations are recommended. Check the Calendar for specific dates for this event. Museum visit only - $5 adults, $2.50 children 6-12. 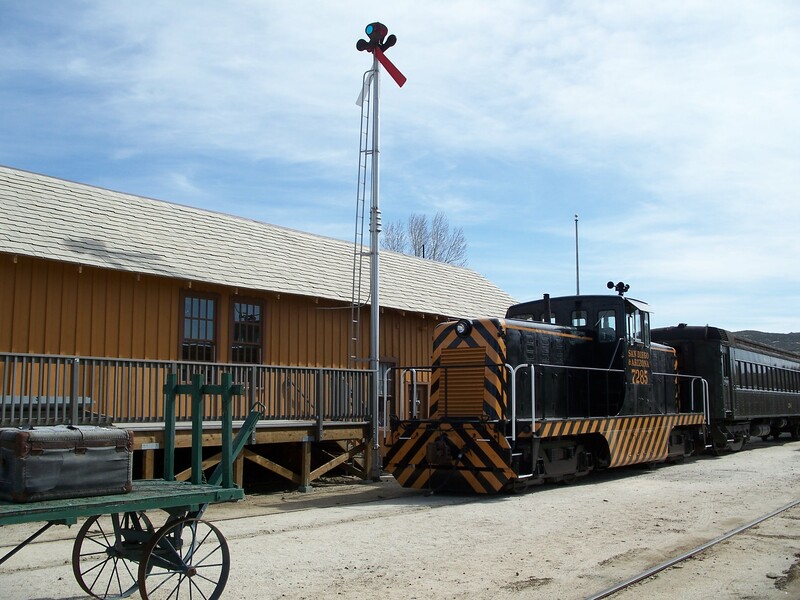 Allows you entrance to our Railway Museum grounds and Display Building where visitors can stroll through our collections of 80+ pieces of equipment: experience steam locomotives, passenger cars, freight cars and cabooses, with interior visits available for some of the trains. Spend as much time as you like. Reservations are not taken. Open 9AM to 5PM on selected weekends. Tickets available at the Campo Depot. AT LA MESA - The La Mesa Depot Museum is La Mesa, California's oldest building in its original form and is the sole surviving San Diego and Cuyamaca Railway Station in existence. The building you see today on the corner of Spring Street and La Mesa Boulevard in downtown La Mesa has a colorful history. Currently open to the public on Saturdays between 1PM and 4PM, visitors also interact with a period freight train with a steam locomotive, refrigerator car and caboose. Conveniently located across the street from the La Mesa Blvd trolley stop - come on out and enjoy an hour at this old-time station in downtown La Mesa. Please visit the archive of selected Museum News items. The Museum's web site offers a wealth of information in support of its mission to present and interpret railroad history. Please click on the following major topic links to start your exploration of rail history. The Museum's main facility is located in Campo, California, about 50 miles east of downtown San Diego. A restored depot is also operated adjacent to the trolley tracks in La Mesa. The Museum is operated by volunteers, who are responsible for every phase of its operation. An FRA (Federal Railroad Administration) approved training program is utilized to safely train brakemen, conductors, fireman and engineers. Indeed, many Museum volunteers have gone on to full-time employment with various railroads and Amtrak. The Campo facility is home to most of the Museum's collection. More than eighty major pieces of railroad equipment are on display, with many of them in various stages of restoration by the volunteers. The Pacific Southwest Railway Museum Association, Inc. reserves the right, at its sole discretion, to withhold and/or withdraw permission to photograph on its premises or to reproduce photographs of objects in its Collections. Policies have been outlined in the referenced link to provide further information on how to gain necessary approvals for various photography needs. Tecate & Carriso Gorge: Passenger trains to Tecate MX or through the Carriso Gorge are not possible at this time or in the foreseeable future. If conditions change, the Museum will make announcements regarding passenger excursion trains on this web site. Enjoy the slide show on the right showing the view from the cab of a westbound freight climbing through the Gorge delivering the Museum's new Alco S2 locomotive to Campo. The Museum thanks The Carrizo Gorge Railway for moving the locomotive as a donation and for the photos of the move. A Hi Resolution slide show is also available. While in Campo, be sure to also visit the Gaskill Brothers Stone Store Museum and the Motor Transport Museum to complete your understanding of local Campo and transportation history in the region. The Museum is always in need of additional volunteer assistance. If you are interested please notify Lew Wolfgang to receive further information on membership benefits. If you have ever been moved by the mournful wail of a steam locomotive whistle echoing across the valley, perhaps you should consider joining us. These web pages are under continuous development in support of the Museum's community outreach program. Please visit often and be sure to leave your suggestions on how we can better serve you. For more information about the Museum, please contact Customer Service. 4695 Nebo Drive, La Mesa, California, 91941-5259, U.S.A. All rights reserved.